Although I have only had the product for a few weeks, it is holding up very well. I like the way that it firmly holds all contents (credit cards and money), so you do not have to worry about things falling out. I love this wallet! The moose leather has a rustic look. I initially used it like a male version of a cocktail purse to give me a break from my George Costanza wallet when not wearing cargo pants.. n Now it’s my go to wallet and I’ve streamlined what I carry. I carry my drivers license with my insurance card behind it, three credit cards and a debit card and about 10 bills of various denominations comfortabley in my front left pocket. I traveled to Costa Rica a lot and a front pocket wallet is the safest thing. I live here now and still love this wallet. 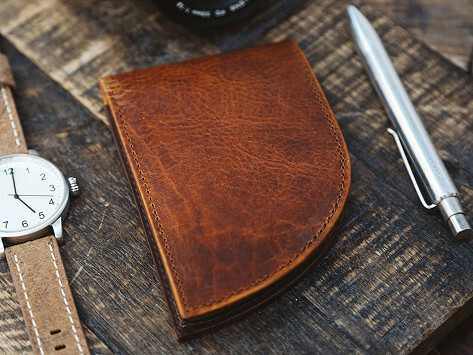 I ordered the Moose Leather Wallet for my Husband. He is picky on wallets. He loves it. He likes having it in his front pocket. He was wanting to not have it in his back pocket ( Her has lower back issues) but didn't like the money clip idea. This is perfect!! After I wore holes in my pants’ back pockets from wallets, I switched to the front pocket, but traditional wallets were too bulky to work well. 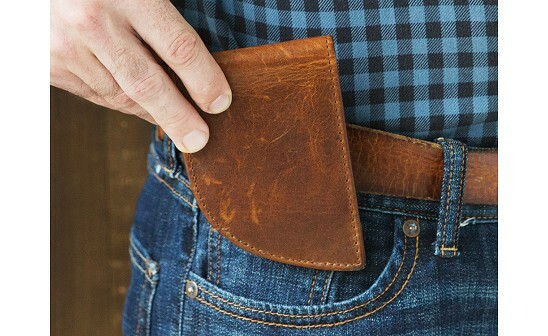 This wallet, because it was designed for the front pocket fits perfectly. I did have to weed out some rarely used cards to go with the limited number of card slots, but it holds the essentials and finally gives me a slimmer look with the benefits I’d a front pocket wallet. I got it in moose hide, which I love. It appears to be extremely well made. Glad to support a family-owned, Made in the USA business as an extra benefit. My husband loves his new wallet! It is ideal for him because he doesn't carry much in it and it fits nicely in his front pocket. He likes that he doesn't have to sit on a chunky wallet.